A sandwich tasty enough to be exclusively offered to Foxwoods Club patrons. 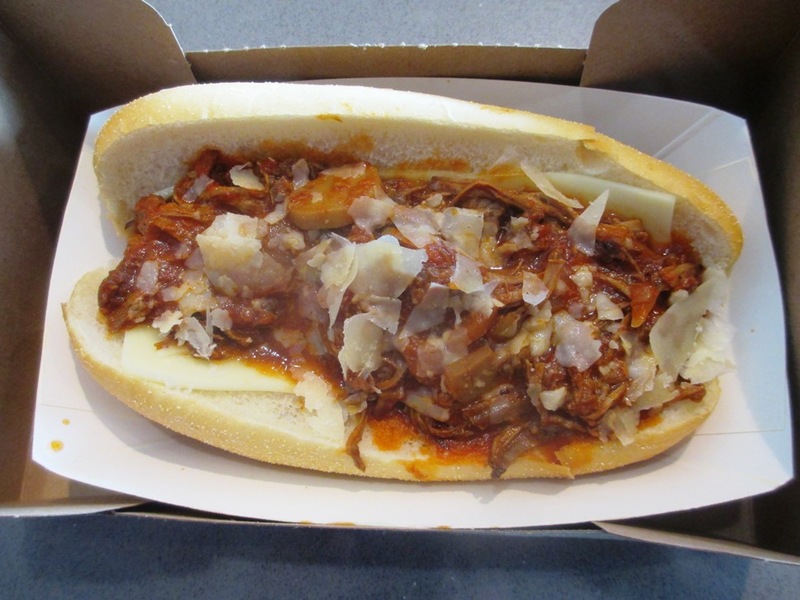 Food at Citi Field, Tip #1: The Rao’s Pizzaiola Hero. The Rao’s meatball and other sandwiches are so exclusive that you either have to know someone to get into the restaurant, or have access to the Foxwoods Club at Citi Field. Fortunately, access to the Foxwoods Club is not hard to come by. I unfortunately had to replace the Josh Capon Pressed grilled cheese I used to have on this page; it was replaced with the Bash Burger stand in 2017. But I had the good fortune to try this one in the Foxwoods Club, and it tastes even better than it looks. This thing was piping hot and that sliced parmesan was melting into the sandwich, and the sauce was just the right level of spicy. If you can get access to the Foxwoods club, definitely have one of these. If I could make one of these, I’d never leave the house. Food at Citi Field, Tip #2: The Pat LaFrieda Steak Sandwich. Pat LaFrieda is a pretty big name among meat purveyors in NYC; his steaks are served in some of the biggest steakhouses in Manhattan. He’s also known for humane treatment of animals, although they all still end up on the grill. 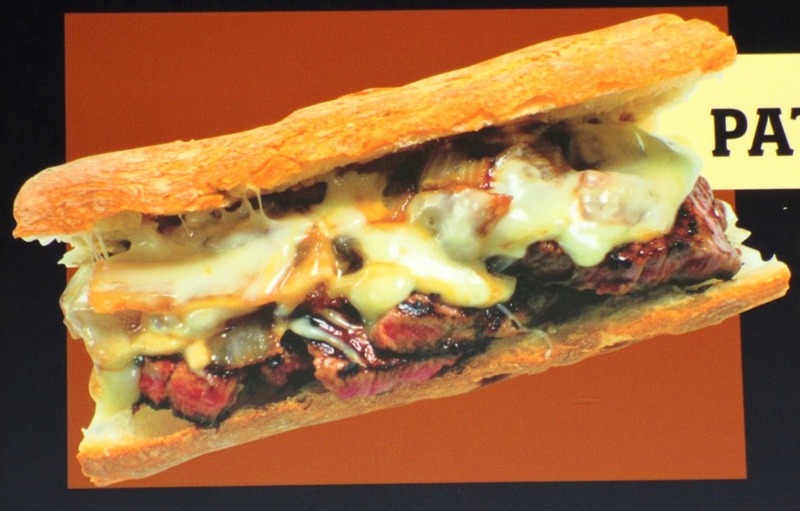 The steak sandwich at his Citi Field stand is very different from a Philly-style cheesesteak; thick strips of filet mignon are dipped in au jus, and placed on a baguette with caramelized onions and Jack cheese. It carries a hefty price tag even for a ballpark sandwich, but judging from the lines, people think it’s worth it. If you’re old enough, the Mojo Risin’ will get a song playing in your head. 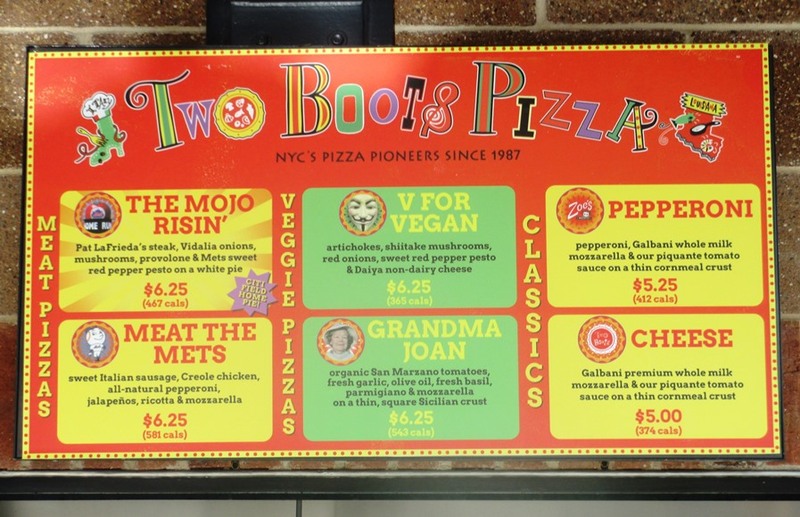 Food at Citi Field, Tip #3: Two Boots “Meat The Mets” Pizza. Two Boots replaced Cascarino’s in 2012; their pizza is popular enough at Citi that another location was added to the Promenade Level. Today, with Papa Rosso’s different but equally good pizza in the outfield, Two Boots is on the Promenade Level and in the Foxwoods Club. Two Boots has a variety of unusual pizzas with New York-style thin crust, but the “Meat The Mets” pie is especially interesting; it’s got Creole chicken, pepperoni, Italian sausage with jalapenos and ricotta. It’s like you don’t even need the crust. As of this writing, Two Boots only offers pizza in slices, but they may do whole pies in the future if the demand is there. As it is, I would jump on a slice early before it’s been sitting too long…take it from a veteran of the NJ boardwalks. Blue for the Dodgers, orange for the Giants. Mama’s of Corona is another local presence at Citi Field, and has been around for Mets games since the days of Shea Stadium. They’re known for New York Italian deli-style sandwiches with truly necessary ingredients like roasted red peppers…they are an underrated hidden gem here. They’re also known for a tasty, cold cannoli. It’s not that the Mama’s cannoli is the best cannoli you’ll ever have, although it ranks up there in my case. 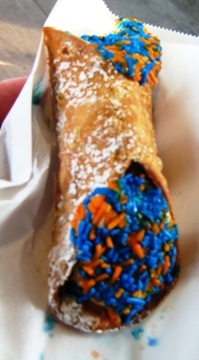 The best thing is the blue and orange sprinkles on each end. In a ballpark that was initially chastised for not paying sufficient tribute to its team, the sprinkles make it clear. It’s a perfectly tasty pastry too, a crispy shell doused in confectioner sugar containing a sweet creamy filling. And Mets-colored sprinkles. Take a picture. Mama’s of Corona is located in the World’s Fare Market, in the right field dining area. There is a Mama’s on the Promenade level as well. Those are three (plus!) items of food at Citi Field you can try out at your next Mets game; but there’s also the Blue Smoke brats, the Fuku chicken sandwich, and the hot pastrami sandwich on rye among many other choices. 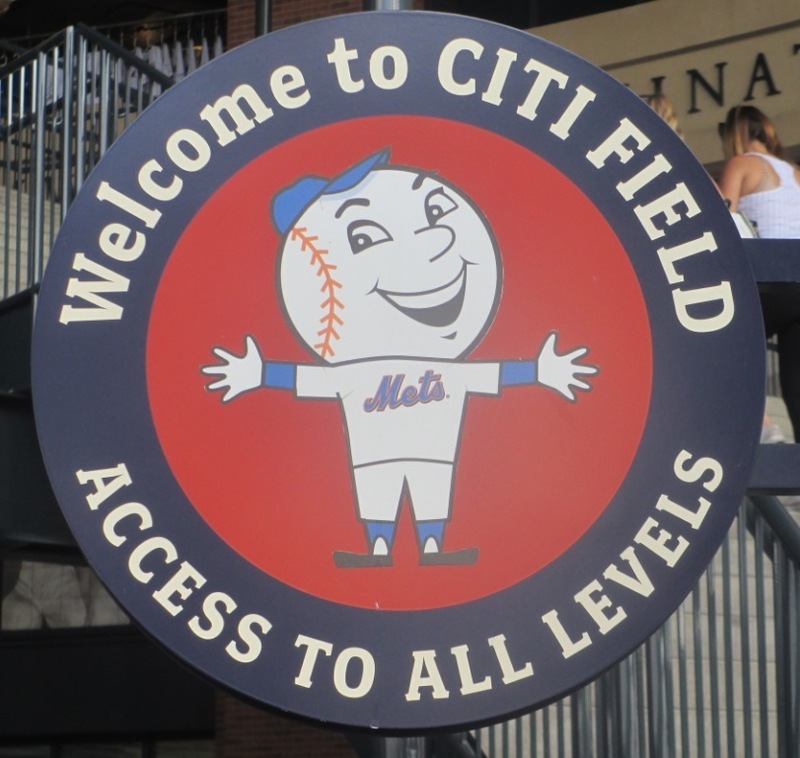 Or you may just want to solve the Citi Field Burger Dilemma.